I have decided to try my hand at Etsy. Wow, this is a lot of work and just like Rome, my shop won’t be built in a day. Photographing for Etsy is different than the flat, what you see is what you get photography I do for Ebay. Geesh, gotta learn how to pull out all the stops, use props, write the story behind the item and anything else that will help it stand out to buyers. There is a big learning curve. Why am I doing this you might ask. Ebay raised their listing fees and the commission they charge when something sells. This is great for the power sellers who run a full time business and who also get discounts but not so good for the little artisans who are trying to get noticed. It is simply too expensive. 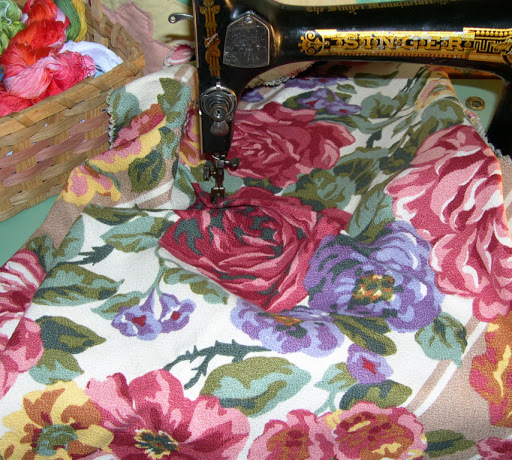 I love to find vintage linens, vintage fabrics and unique one of a kind fabrics. I have an extensive collection but I need to move some of it along so someone else can give it TLC. I plan on trying to list 3-5 things a day from this stash. There will be ribbons, buttons, fabrics, linens, saris and whatever else I might come across in my explorations. When I have a decent inventory of vintage fabrics and supplies, I will start to list some art and artisan crafted jewelry. Maybe even an art quilt or two. Hope you visit me, send some friends and if there is something you are looking for along these lines, send me a note and I will let you know if I have it. I'll be watching/reading your upcoming posts. I want my friend to get selling her items on Etsy. also, will be interested in items you have for sale!